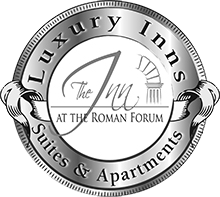 Between the Fori Imperiali and Colosseum, near the very old Church of Santi Quirico e Giulitta, with its unmistakable Romanesque campanile, The Inn At The Roman Forum is in a perfect spot for discovering the ancient wonders of Rome as well as the modern and elegant city of boutiques and shopping. From here you can start a fascinating walk along Via dei Fori Imperiali, right in front of the property, to see the history of the ancient city: Julius Caesar, Constantine, the Colosseum and Trajan's Column. In a monumental succession it is possible to see: the Forum of Caesar, the first after the Republican era; then Forum of Trajan, Forum of Augustus and Forum Transitorium (also called the Forum of Nerva). Near the Grillo hill are the Markets of Trajan, with their unique semicircular structure. To the right of the Altare della Patria rises Trajan's column, a masterpiece of Roman sculpture. From here Via dei Fori Imperiali starts: on the left the Forum of Augustus continues with the Forum Transitorium, unmistakable with its grandiose columns called the Colonnacce.